– Play some scary halloween music for the full effect. So here goes my Frankenbot ready for Halloween. Step 1. 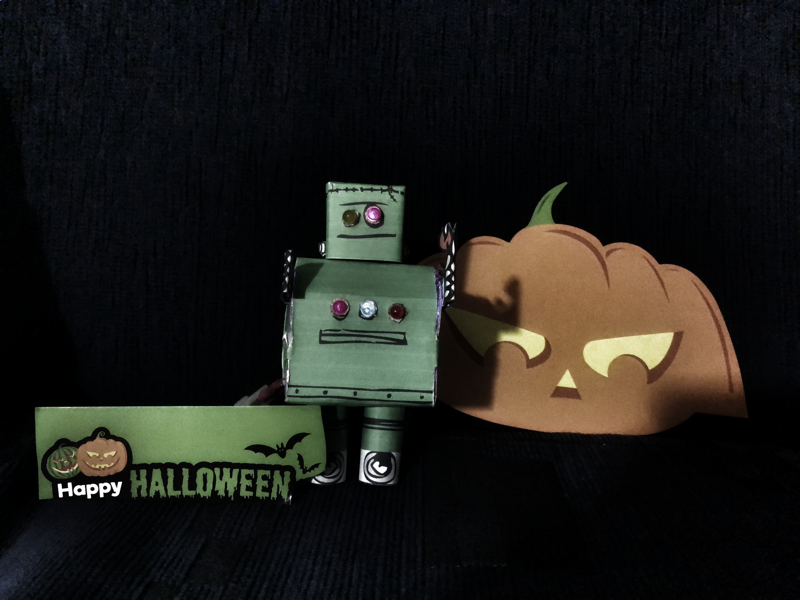 Create the Frankenbot papercraft using the instruction from Instructables. I use the recycle LEDs that was joined together with one 220 ohm resistor. Different legs was connected to the same resistor so only one eye will be on at a time, and you will have to switch the polarity to light up the second eye. Cut out 3 more holes on the chest. It is much easier to cut it out when you had the robot chest disassembled. I am using the recycled electronics from the “Light Activated MP3 player” from the earlier post. You can follow the link to find the instruction on how to build one. Things to note, the way the light activated will need to be reversed, in this we want the Frankenbot to stay idle when there is sufficient light detected by the sensor, and when the light is off, it will came alive blinking it’s eyes and the chest lights and also playing the horror music at the background. So minor modification to the source code is necessary. The section above is when the light intensity is low, so we flicker the eyes LED and the chest LEDs. The following section is when the light is high, we only have one eyes turned on. Now upload the code and test it, if all goes well, when you flick the switch your Frankenbot will come alive. Cover the sensor or turn off the lights, it’s eyes should flicker and the chest LED will flicker too. If you like this you can subscribe for frequent update and leave some comments.